Last night we had some vine ripe tomatoes to use up. Since there was basil and mozzerella in our main dish, I decided to try a different flavor than the traditional Caprese salad. This salad is simple and has some wonderful sweet and salty notes. 1. Arrange the sliced tomatoes on a plate. 2. Toast the pine nuts in a hot pan for 2-3 minutes or until golden brown. Stir often so they do not burn. Remove from heat a minute before they will be done, since the pan will throw residual heat. 3. Heat balsamic vinegar in a saucepan, and stir constantly over medium high heat until reduce into a syrup; about 5 minutes. Stir constantly to avoid burning. 4. 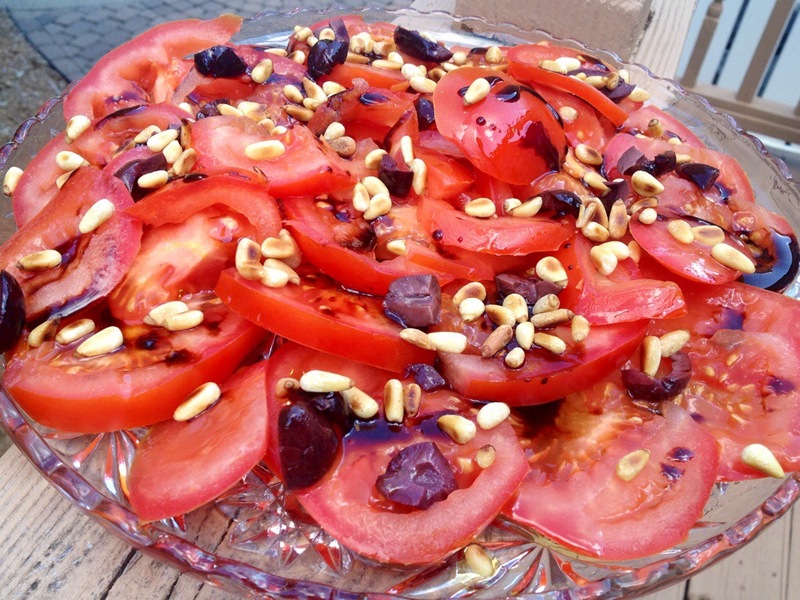 Drizzle balsamic glaze over tomatoes, top with olives and pine nuts. Looks awesome. Those sungold cherry tomatoes are the bomb!